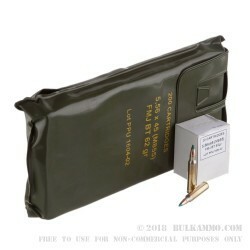 Prvi Partizan, a Serbian outfit and ammo manufacturing experience dating back to 1928, offers these Battle Packs as an excellent way for shooters to stock up on top-quality 5.56mm NATO ammo. Prvi is well known for their consistent products and is recognized in the U.S. as a high performing import brand. Their polyurethane Battle Packs hold 200 rounds each, are easy to carry with built-in handles, protect ammunition from humidity and corrosion, and can be easily stacked in a safe or closet. Each of these bulk cases includes five separate battle packs. 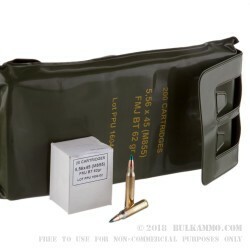 These 5.56x45mm cartridges use components in accordance with M855 specifications; this includes clean-igniting Boxer primers accompanied by sealant which ensures reliable function. Each primer is installed at the base of a reloadable brass casing which has been heat-treated at the neck and shoulder for safe flexibility which provides long reloading life. The round profile is topped off with a 62-grain, full metal jacket projectile with a boat tail rear (FMJ-BT). The bullet's tapered tail resists in-flight drag while its toothed cannelure maintains crimp position under recoil; both features translate to greater stability and accuracy from nearly any barrel twist rate or length. 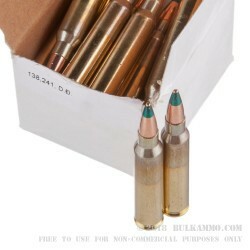 As M855 ammo, these rounds feature green paint on their tips which denotes their penetrating ability. 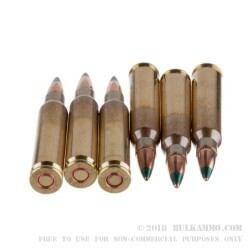 It is ill-advised to use these rounds on steel targets that you intend to keep or at indoor ranges.